The Papaver Somniferum (Opium Poppy) plant was cultivated in the ancient civilizations of Persia, Egypt and Mesopotamia. 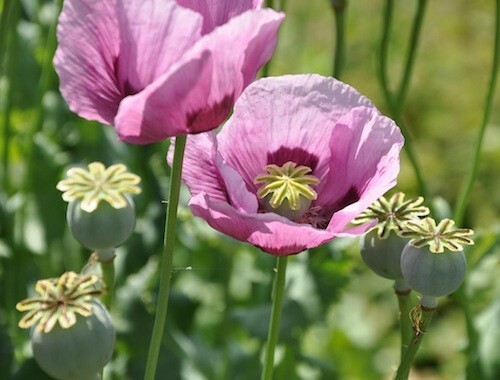 Archaeological evidence and fossilized Papver somniferum seeds suggest that Neanderthal man may have used the opium poppy over thirty thousand years ago. The first known written reference to the Papaver somniferum Opium poppy appears in a Sumerian text dated around 4,000 BC. The flower was known as hul gil, plant of joy. Papaver somniferum has also been variously called the Sacred Anchor Of Life, Milk Of Paradise, the Hand Of God, and Destroyer Of Grief. From Opium Poppy's mid-Eastern orgins, its use had spread throughout Europe by 2000 BC. And by the 8th century AD Papaver somniferum was widely cultivated in Arabia, India and China. Opium Poppy flower pods grow from a lettuce-like base, atop a single stalk, somtimes over 4 feet tall. The Papaver somniferum flowers are beautiful and grace gardens world-wide. The pods are very popular in dried flower arrangements, and the seeds are commonly used in baking.